St. Caritan or Cariotan, of Druim-lara. At the 7th of March, in the Martyrology of Tallagh, we find a St. Caritan, of Dromalara, entered. In like manner, Marianus O'Gorman, has noticed Caritan of Druim-lara. But, the exact identity of this saint, and of his place, appears to be unknown. It is conjectured, by Colgan—who has Acts based on the supposition at this date—that owing to some mistake of copyists, the present holy man may be the same as a distinguished priest, called Cruthnechan, who baptized St. Columba, who had charge of his infantile years, and who was remarkable for his piety. Without attaching weight to it, the Bollandists merely allude to his statement. We cannot see, how it can be well established. Again, Cariotan, of Druim-lara, is registered in the Martyrology of Donegal, as having been venerated on this day. 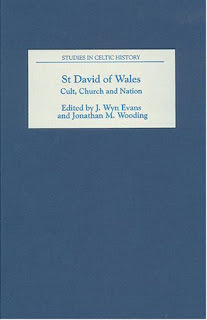 In the first millennium A.D., prior to the promotion of St David’s cult by Rhygyfarch, St David already can be seen to have enjoyed a significant reputation not only in Wales, but across the Irish Sea. Dauid Cille Muni features amongst three Welsh saints whose feasts are recorded in the Latin Martyrology of Tallaght and the Irish Martyrology Félire Óengusso in the early ninth century – both probably the work of the same author, and certainly of the community of the Céli Dé of Tallaght. David also appears in another early list of saints, the Catalogus sanctorum Hiberniae, where he features amongst the British saints from whom the ‘second order’ of early Irish saints are held to have accepted their ritual of the mass. His obit appears in Irish annal collections, probably entered at some time in during first millennium. These references would appear to speak to the relations between the westernmost part of Wales and its closeness to Ireland – the same relationship, perhaps, as is evinced by Armes Prydain Fawr. The kingdom of Dyfed, the early medieval polity in which the region of the modern St Davids is located, was itself, of course, originally under an Irish dynasty – a fact that appears to have been still known in Rhygyfarch’s time – but it would be unwise to place much weight upon this early Irish connection of St Davids. The association of David’s cult with Irish saints are as likely to reflect later as earlier connections between these closely adjacent countries. Most of the dedications to the saint in Ireland can be shown with certainty to have been made under Cambro- or Anglo-Norman patronage. The appearance of David in the Irish Martyrologies, however, speaks to exchange of cults between Ireland and Wales before A.D. 800. Irish uitae add further detail to this testimony. St David features in the Vita of St Molua of Clonfert-Mullow and in the Vita of Ailbe of Emly. In both cases he appears in the versions of these uitae that are preserved in the Salamanticensis collection amongst the subset (the ‘O’Donohue group’) which Richard Sharpe has identified as preserving a putatively eighth-century form. The arguably early reference in the cult of St Ailbe is thus of especial interest for the fact that Ailbe (Elvis) is a saint with a cult near St Davids. In Rhygyfarch’s Vita S. David Ailbe is joined by more Irish saints: SS. Patrick, Brendan, Maedóc, Bairre, Modomnóc and Scoithín. Patrick and Ailbe are given the most significant roles in Rhygyfarch’s Vita. The role of St Patrick – who has a dedication near St Davids, at Whitesands Bay – is to be the previous denizen of Vallis Rosina, the place that will later be the site of St David’s monastery. St Ailbe’s role is to baptize David. These roles reflect the significance of these saints in Irish history: Patrick as apostle to the Irish; Ailbe as patron to Munster, whose church was second only in status to Patrick. Pádraig Ó Riain is right to argue that these ‘facilitating’ roles are intended to establish St David’s status as superior to that of other major insular churches. They are products of a time when these saint’s cults had already achieved their existing status in Ireland, not of the time of the historical David. How early or late this period of exchange of information may be placed is a point of contention by Ó Riain. Jonathan M. Wooding, ‘The Figure of David’ in J. W. Evans and J.M. Wooding, eds., St David of Wales: cult, church and nation (Boydell, 2007), 11-12.